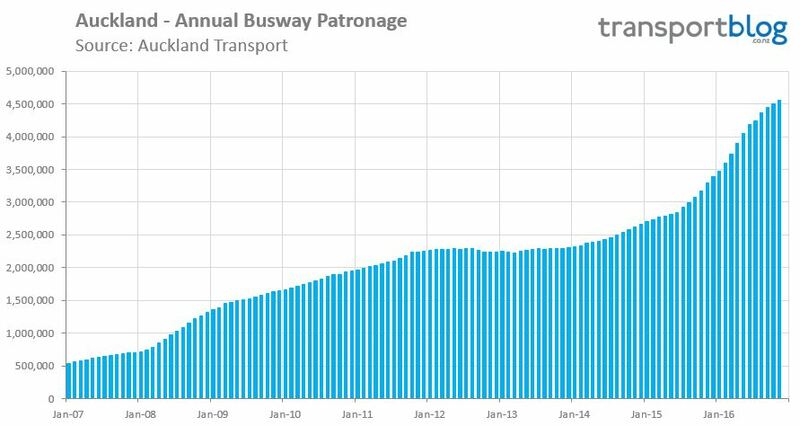 The Northern Busway has been one of Auckland’s major public transport success story’s, helping ever increasing numbers of people get around the city while avoiding congestion. It’s been a key factor in seeing around 40% of people crossing the harbour bridge in the morning peak now doing so on a bus. And despite the busway itself opening in 2008, there’s been seeing a surge in usage over the last year or so which has coincided with the introduction of Double Decker buses – which are now standard on almost all Northern Express services. Yet this success comes despite the busway only being about 7km long, just 41% of the distance between Albany and the city. One important win that’s occurred in recent years is that the NZTA will extend the hugely successful Northern Busway all the way to Albany in the coming years – although it only comes alongside a massive motorway project. However, an article on Stuff raises concerns about an important aspect of those plans, that authorities can’t seem to agree on where to put a new station. 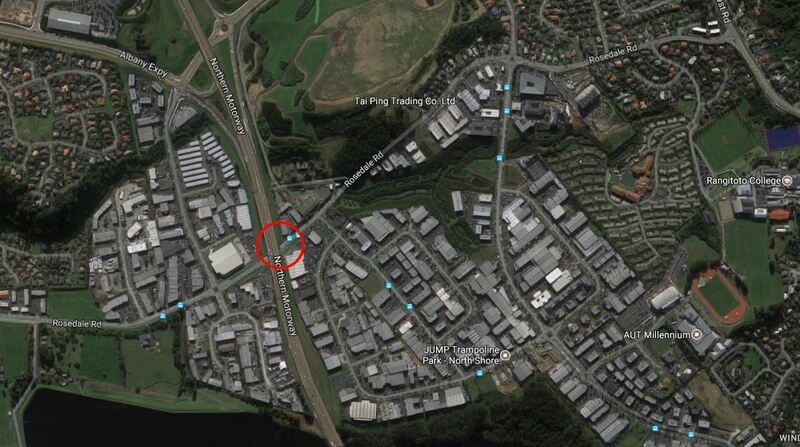 The exact location of a new bus station on Auckland’s North Shore will finally be decided in 2017. First mooted in 2015, the bus station is part of a project to improve the Northern Busway and has received “overwhelming” public support. But, after two years of investigation by the New Zealand Transport Agency (NZTA) and Auckland Transport (AT), a precise site for the new station has still not been chosen. 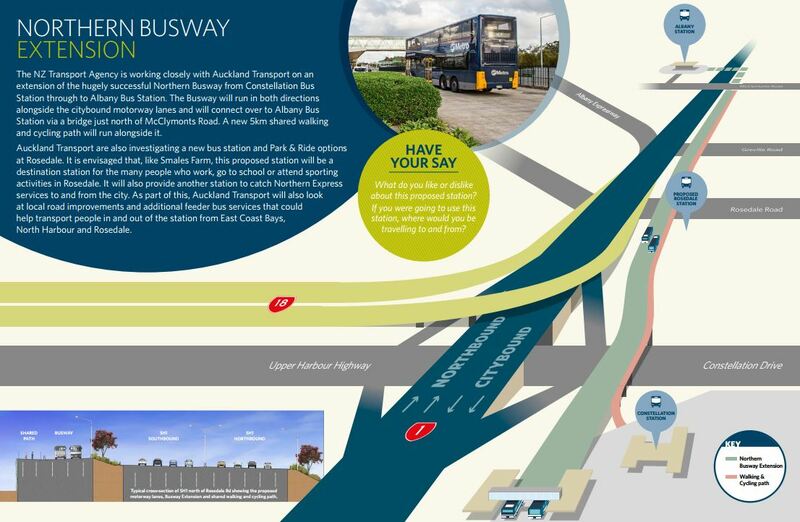 The Northern Corridor Improvements project will see the Northern Busway extended from Constellation Bus Station in Mairangi Bay all the way through to Albany Bus Station. Original project plans proposed the new station at Rosedale, as part of the wide-ranging works. However, the new bus station has been left out of plans that were lodged with the Environmental Protection Authority (EPA) in November. NZTA’s Auckland highway manager Brett Gliddon says the bus station is still being “actively investigated” and a final decision on the location will be made next year. This is what the NZTA have said in relation to the busway in the past and it also hints at what some of the problem might be. A station linked to Rosedale Rd makes a lot of sense, given there’s a decent little patch of employment within easy walking distance. Auckland Transport are also investigating a new bus station and Park & Ride options at Rosedale. It is envisaged that, like Smales Farm, this proposed station will be a destination station for the many people who work, go to school or attend sporting activities in Rosedale. Destination stations are usually reserved for important locations such as large centres or interchanges, for example, New Lynn, Newmarket, Otahuhu, Panmure and of course, as mentioned in the text, Smales Farm. These stations are normally impressive but are both costly and/or where bus interchanges are concerned and they can consume significant amounts of land. This would be especially so if they also plan to include a park & ride. As such, it would be no surprise if we were to learn that cost of such a station, both monetarily and in land use, was a sticking point in the decision. In my view a destination station is wrong for Rosedale and instead something more akin to the Sunnynook Busway Station, a fairly simple but efficient station, seems more appropriate. What’s more it could span Rosedale Rd to give easy access to footpaths on either side of the road and to bus stops for local bus services. Let’s hope they can get the details of this busway station sorted soon so the NZTA don’t leave AT behind. Talking about interchanges, both Sunnynook Road and Rosedale Road have a big advantage for feeder buses over Smales Farm or Akoranga: they have a street which actually crosses the motorway. Contrast that to all the detours and loops a bus going from Milford to Northcote would have to do at Smales Farm. And while it’s not a fancy interchange, I still think it would be easy to transfer onto the NEX from Sunnynook Road. It’s just that for some reason there’s no regular east-west service over there. I’m a bit surprised that Smales Farm is called a destination Station. It is flanked by a golf course and a big parking lot with a couple of office buildings. A significant number of people work in the office park with more buildings going up, and the hospital is across the road. Plus a lot of the schools in the area. Also connects with buses for central takapuna/milford/the bays. Smales Farm station is pretty busy! I cycle down Rosedale Rd regularly and it has long queues of cars now, often interfering with the cycle lanes too. A park n ride would be a terrible idea as it would create more congestion from well intentioned people trying to get to the busway. A pedestrian station like Sunnynook would be best. Yes I think a small station here would be best and as Mat says, more likely to get done. I think more could be done to speed up the existing busway too with perhaps cheap lane separators & legal speed increase for the buses, some (more?) light priority. For more cost, perhaps better proper alignment to get the buses in and out of the stations quicker….perhaps I’m just to used to the buses we run on rails down south. Perhaps the station could include replacing the roundabout that causes the queue. I know it’s not fashionable as some people seem to support bottlenecks, but just getting rid of the roundabout and installing signals might help pedestrians, cyclists and heaven forbid drivers and passengers in cars too. +1, the roundabout is also a death trap for cyclists at present. Signalise it with Dutch style cycle lanes. Hmmm… like Sunnynook they say? The most unloved station on the Busway network? The one with nearly zero connecting services (and those that do are insufferably meandering)? By all means build a “local” station but please ensure connector services and please add to Sunnynook’s! AT’s effort on the New Network on the Shore is really poor. Same issue further south, at least Northcote (lots of growth planned over there) should be connected to the busway and preferably to Birkenhead and Takapuna. The hard part will be getting buses across the motorway without wedging them in congestion. They really don’t need to be that substantial. Build Sunnynook in reverse, simple. but surely now 40% of the people in the peaks deserve something better than mixing with SOVs south of Esmonde! A good station is one which is easy for people to get from the road or footpath and over to the platform. No long winding ramps. Manurewa and Sylvia Park stations are good examples, inexpensive and busy. Otahuhu is large, expensive, difficult access, has no escalator, not busy. There’s a simple reason the station at Rosedale Road hasn’t been announced. NZTA do not own the land it’s proposed for. And getting it off the owner is looking exceedingly difficult. NZTA have the power to acquire land. That’s not a roadblock (just a complication). AT ‘s original plan was for a kiss and run station. Mid year they changed to a Destination Station as much as anything to relieve pressure on Constellation which has zero parking available from about 6.30 (I know the argument is feeders but people aren’t in the main using them). One of the land owners that needs to go for the proposed Rosedale Station has dug their heels in and AT are reluctant to compulsorily purchase. Now looking at the area between Albany Expressway and SH1 by Tawa interchange which IMO is too close to existing Albany station and is problematic because it would mean moving the location of the motorway overbridge. integrate fares should reduce disincentives for people to connect. But ultimately what AT need to do is charge for park and ride at Constellation. I suspect people would then very quickly find their way onto connecting services. P.s. I’d recommend avoiding use of the term “feeder” services. The reason being that most bus routes seek to connect with many destinations, one of which is other public transport services. But few bus routes exist solely so as to provide connections. Indeed, even with an NEX station at Rosedale, the majority of the patronage on the connecting bus services would not be associated with passengers transferring to NEX services. If there is no parking, then price it. Well clearly they are. Each morning 1,700 passengers join the busway to head inbound to the city at COnstellation. There are 400 car parks, so obviously 3/4 of Constellation passengers don’t use park and ride. I’m also reminded of the intercept survey of park and ride users at Albany and Constellation. A full 50% of them were people that previously caught the bus the whole way. The park and ride is a huge opportunity cost of land to get four bus loads of new passengers on a system that runs a hundred buses a hour. The fact that the carpark is already full and done by 6.30 while the station is at its’ busiest from 7 to 8:30 illustrates why they shouldn’t care about park and ride at all. It really does very little. You could get 1,100 comfortable 2 bed apartments on that site (assuming 10 floors and 50% of land can be floor area). You’d think that 3,000 resident would do more for ridership than 400 car parks. i absolutely agree with you Sailor Boy that again simple maths shows that park n ride is not the best way. If people are still sceptical about this then we can look at overseas examples where intensification is focused on transport stations. @Winston: Would that be the owners at 121 Rosedale Road (block of shops), or the owners of 5 Arrenway (Turners)? There is a pretty disused site at 123 Rosedale Road (next to the refuse transfer station) which could be used for a kiss n ride/local bus transfer space however Rosedale Road is pretty congested at the best of times. I think the best option is to make use of the “free” air space over Rosedale Road.